A British journalist has been detained by security forces in Ukraine. 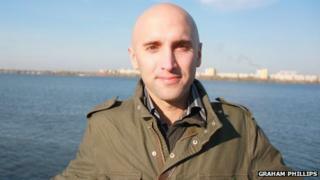 Graham Phillips, 35, was stopped by the National Guard at a check point in Mariupol, eastern Ukraine on Tuesday. Mr Phillips, who grew up in Nottingham before moving to Perth in Scotland, works as a freelance journalist and had been contributing to Russia Today. Russia Today said Mr Phillips had called to tell them of his detention but they had since lost all contact with him. The English language TV network claimed a source had told them Mr Phillips would be released if he deleted footage he had recorded near a roadblock. Alexey Kuznetsov, deputy head of Russia Today's English department, said: "We still cannot get in touch with Graham, we are extremely worried what could happen to him." On Monday Mr Phillips tweeted about growing calls for him to be arrested and deported from Ukraine. His last tweet on Tuesday said that he had been "secretly filming" with a senior doctor at a morgue in Mariupol. A spokesman for the Foreign Office said they were "aware of reports of the detention of a British national and are looking into them". He added: "We stand ready to provide consular assistance."